Tagline: Horror has returned to Haddonfield. After a seven year hiatus Michael Myers is back – or ten years as the plot of this instalment would have you believe. In 1982, the scourge of Haddonfield was put on the shelf in favour of Halloween III: Season of the Witch. The plan was to release a new film every year under the guise of the original franchise. Each movie would have a new story and cast of characters, allowing arguably the most iconic killer in horror to slip into obscurity and retire with the kind of dignity Carpenter’s baby deserved. But money talks and evil walks, so it was only inevitable that our killer’s corpse would be dredged from the dark swamps of legend, dragging the cash-strapped Donald Pleasence along for the ride. The horror icon would star alongside his most formidable adversary twice more before his death in 1995, the last of those films being the wretchedly incomprehensible sixth instalment Halloween: The Curse of Michael Myers, a title that would seem to offer an accurate depiction of our once cherished villain. Donald’s trust in movie producers would diminish dramatically. 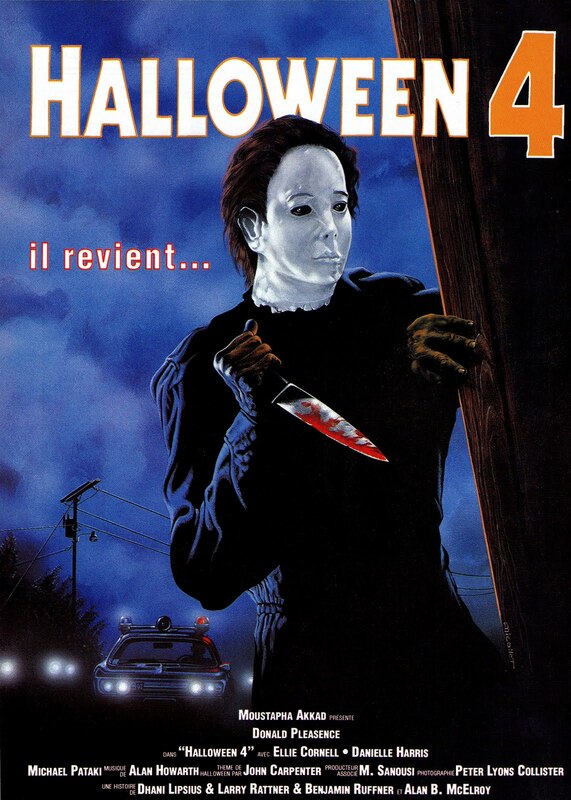 Compared with subsequent sequels, Halloween 4: The Return of Michael Myers is passable as a by-the-numbers slasher that would at least stick to the basics for the most part. Still, the movie is a mixed bag, a confused production that was a victim of late 80s genre expectation. It is not a terrible movie, and as far as he is able the director stays true to Carpenter’s vision. Retaining the grainy quality which made the original so hypnotic, his steady capture of everyday suburbia would effectively set the scene. He also retains iconic staples such as a subtly tweaked rendition of Carpenter’s original score, which in itself is enough to establish tension. Little had clearly studied the source material, developing an appreciation for what separated the original from its sleazy Friday the 13th imitators. By this point the ‘Friday’ franchise had been smart enough to reinvent itself, a heavy dose of tongue-in-cheek meta humour keeping the series semi-relevant in an era when graphic violence had become a no-no in horror circles. Perhaps at the behest of those in charge, Halloween 4 quickly lays waste to its fine early work by descending into a Voorhees-style massacre, one which plunders on without even a hint of the self-referential. Like Jason before him, Myers is transformed from the nigh-on-impossible to the downright unbelievable—and to the movie’s detriment. No longer does our ethereal psychopath cling to the shadows. Instead we spend an inordinate amount of time staring at his bumbling frame, the gaunt inhumanity of his original mask replaced with something akin to a cute smile. All of this serves to cheapen the character’s menace, and the thespian skills of Pleasence border on parody amidst such a shallow formula. The plot itself is as thin as any slash-and-scream fodder. In a rather remarkable stroke of coincidence the authorities have scheduled a patient transfer ten years to the day of the original Haddonfield massacre, a fact that the senselessly unrestrained Myers takes full advantage of. After laying waste to an unnecessary amount of bystanders, Michael then goes in pursuit of his niece, Jamie (Harris), a child he has never met and who he presumably has no knowledge of. Not unless someone in the nest of his deep seclusion had taken the ill-judged step of informing him, but I don’t envision Myers being too much of a conversationalist. Although there’s every chance that he’s a good listener. Here, let me fix your neck for you. 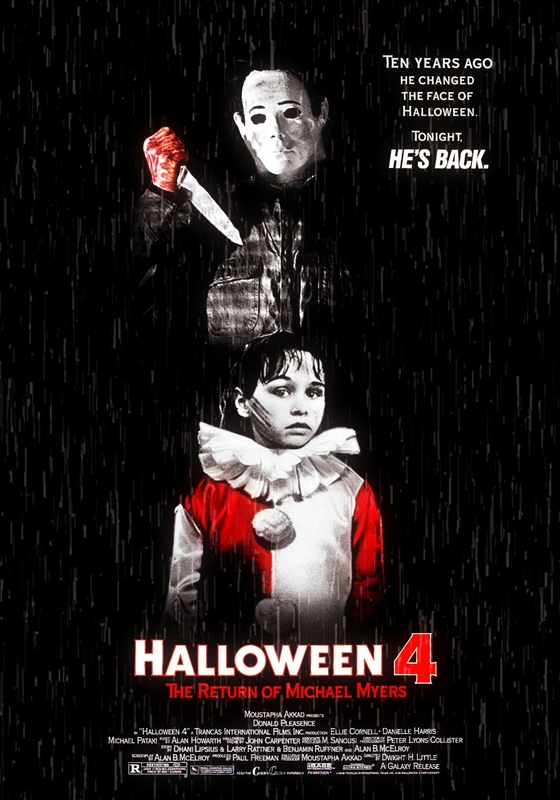 It’s quite the tragedy, then, that Halloween 4 could and should have been a very different movie. In fact, the original screenplay, which there were three drafts of, was centred on the now teenage Tommy and Lindsey, whose babysitting adventures a decade prior had left quite the indelible mark. Dennis Etchison, a writer who had already penned the novelisations of The Fog and the first two Halloween sequels, had once again been recruited by Carpenter and long-time colleague Debra Hill, and he had been thrilled to finally be involved in the cinematic side of things. 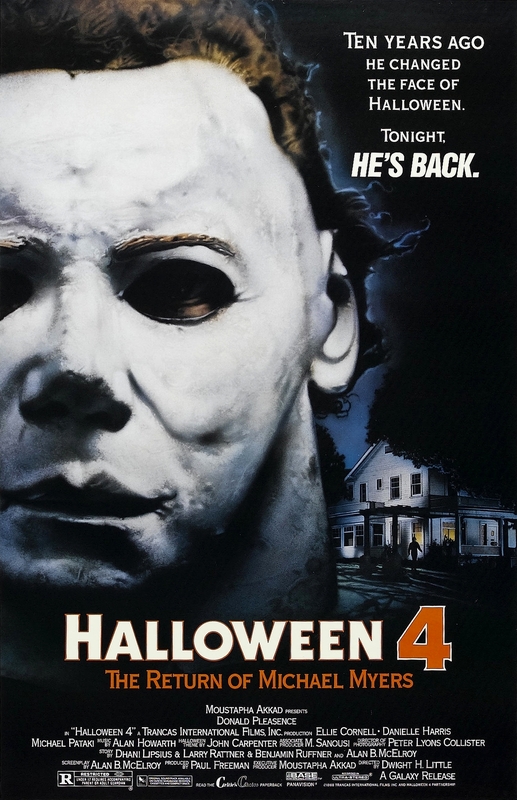 In his movie, Halloween had been banned in Haddonfield and was no longer recognised as a holiday. “The whole idea was repression versus acknowledging the bad things in the world,” the writer would explain in an interview with Blumhouse back in 2017. Of course, Myers would only be too happy to give everyone a stark reminder of what they’d been missing. Halloween 4: The Broadway Musical. But business is business, and as usual it is the fans who end up footing the bill. What we get instead of Etchison and Carpenter’s intriguing developments is the beginning of the whole Jamie saga, who would go from potential Myers substitute to telepathic mental case with a hefty dash of pseudo-paganism thrown into the mix, and it all began with Halloween 4. As the movie transpires, Jamie is plagued by dreams of a man she has never met, and when a zillion-and-one bodies turn up in Haddonfield, Dr. Loomis’ suspicions of a family reunion are quickly realised. The problem is, healthcare corporate are sick and tired of his Shakespearean ravings, and it is left to a band of pot-bellied vigilantes to rid the once quiet suburb of its inhuman curse forever. The best of luck to you, fellers. You’re going to need it! Somehow boarding a speeding pick-up truck unnoticed, the colossal, cute-faced Myers decimates an entire clan of beer-bellied locals before reaching into the vehicle and tearing out the unsuspecting driver’s throat, taking the movie’s body count into the mid 20s. Fleeing to the attic with Jamie, a terrified Rachel attempts to stop our deranged killer in his tracks, blocking the stairway with a bunch of empty cardboard boxes. If the cast of the original film had been so resourceful, perhaps all of this carnage could have been avoided! Coming to the aid of jilted love interest Rachel, cheating douchebag Brady (Jenson) takes a moment to clear up matters. A sour brew of studio bastardisation, Halloween 4 is the brainchild of lousy corporate parenting. Left to his own devices, director Little might have contributed something worthy of the original’s legacy, but the movie’s inability to mesh the Myers ethos with the smash-mouth formula of his most famous imitator proves devastating to the franchise. Great review!I enjoyed this one despite its many faults.It is nowhere near as good as the first three but I have a fondness for the Halloween franchise and I would watch this again!! Friday the 13th would cleverly reinvent itself as meta-humour following A New Beginning, turning Jason into the Roger Moore of the slasher genre as a way to sidestep the MPAA’s censoring onslaught. Myers would go the same way here. Producers really had no choice if they were to salvage their marquee attraction and keep the lolly rolling in. It’s ironic that the franchise would be forced to imitate the same ‘Friday’ series which had used the original Halloween as its template.